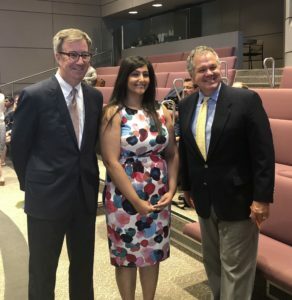 Ottawa – Mayor Jim Watson and Alta Vista Ward Councillor Jean Cloutier presented the Mayor’s City Builder Award to Samia Hirani at City Council today in recognition of her dedication to volunteering and fundraising. Shortly after joining the Aga Khan Foundation Canada (AKFC) as a volunteer guide, Samia Hirani expanded her volunteerism role to act as the local marketing lead for the AKFC’s World Partnership Walk starting in 2010. The Walk is Canada’s largest annual fundraising movement dedicated to fighting global poverty. Funds raised support development initiatives that allow women and men around the world to lift their communities out of poverty and build a brighter future. Ms. Hirani also helped establish a Corporate Engagement Team for the Walk, volunteering over 100 hours to organize the team and help it achieve its fundraising targets. At the same time, Ms. Hirani was always available to assist and encourage other team leads in organizing their Walk efforts. In this year’s Walk, Ms. Hirani raised funds by engaging her own workplace through their youth network and by creating the ‘Public Servants Shattering Poverty’ team, raising over $2,000. Samia Hirani also volunteered with the AKFC’s World Partnership Golf tournament and organized numerous fundraising efforts on behalf of the Walk throughout the year.